With no sign of marital discord, pop royalty Jay-Z and Beyoncé stole the spotlight with the help of their 2-year-old Blue Ivy in a heartfelt family moment at Sunday’s MTV Video Music Awards. 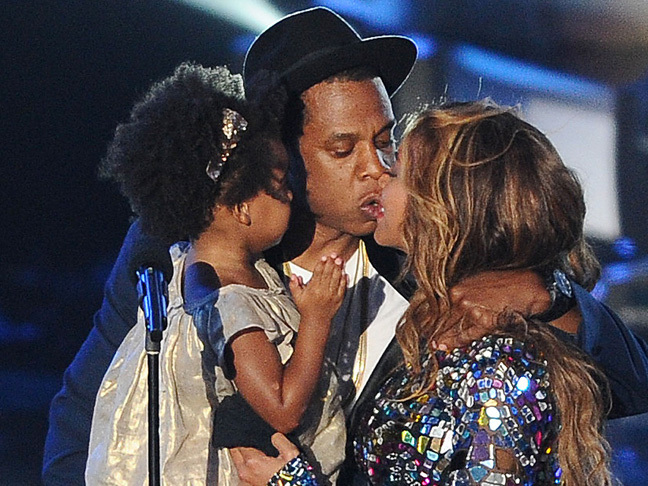 When Jay-Z walked on stage with Blue Ivy to give his wife the Michael Jackson Video Vanguard Award, an emotional Bey had to catch her breath as the two kissed and hugged. Blue clapped along and got a kiss from mom, then, if you weren’t teary yet, she excitedly shouted “Yay Mommy” into the mic. Watch it here. Try to hold back the tears. Jennifer Nettles: Mom-ssentials to Make My Baby’s Life BetterHayden Panettiere Reveals She’s Having a Baby Girl!